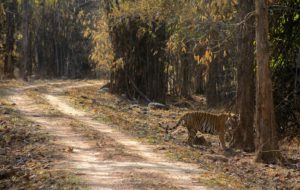 It was 16th March 2016, and I was on accompanying one of our clients who wanted to do a couple of Full Day safaris in Pench Tiger Reserve. 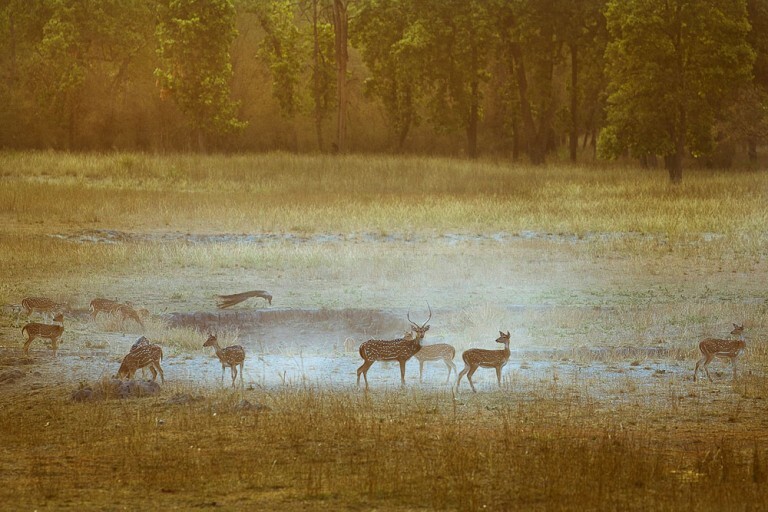 Pench is a very beautiful forest with major cover of TEAK WOOD. And since it was a beginning of the spring majority of the trees had already lost their leaves. Mornings were pretty cold, and afternoon used to get extremely hot and sometimes difficult to bear. Our luck with the tigers was not good till this day. On the previous day, we missed a couple of good sightings by a margin of few minutes. But we got some good shots of wild dogs, and some birds. In the afternoon we used to come out to have lunch at the gate, this when our guide Rupesh advised us to visit Karmajhiri range, and we accepted his advise happily as there was not much expected in the Turia range on that evening. After lunch we started from Turia gate, after about an hour and half at around 4 PM we reached this spot called “BAANS NALA”, our guide suddenly stood up and asked the driver to stop the vehicle. When the vehicle stopped, we could hear a tiger growl, but were quite far. 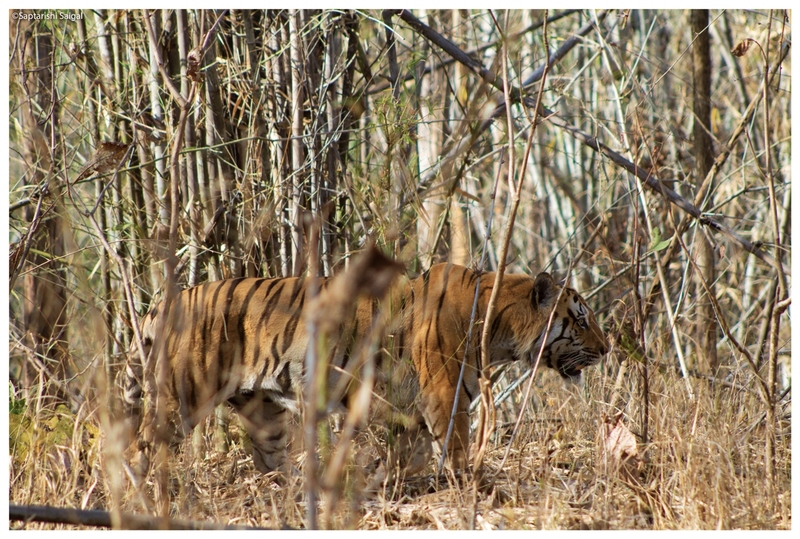 We started moving ahead from where the growling was coming, and we could feel that the tiger was coming towards us. 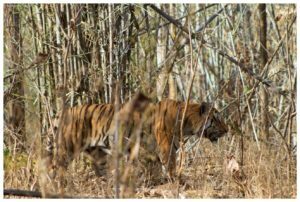 After a while we reached the spot where we knew that the tiger was there, but we could not see him because of thick bamboo foliage around. We thought that he is aware of our presence and hence is avoiding coming out, so we moved a little back to see if he comes out. Nearly half an hour passed but he didn’t come out, but he was continuously growling all this time. His continuous growling was giving us goose bumps and was making us apprehensive if he was injured. After a while a forest guard came, and we told him that the tiger is growling since an hour and we haven’t seen him and told him about our apprehensions. He reported the matter to his senior over the radio immediately, and sat in our vehicle and requested the driver to move ahead so that he can see if the tiger is injured. But due to foliage even he could not see anything. He then decided to go inside on foot, and came back after 10 minutes. He had seen a tiger inside, and he reported that he has started moving towards us and can come here anytime; he said, from whatever little he could see, there were no injury marks visible, and he might be calling for a mate. When he finished his sentence, our guide literally screamed, “SIR TIGER ROAD PE!” And there he was, a healthy male was marking his territory just in front of us. Growling was stopped for a while, as he was sniffing and marking his territory, and later again started moving towards us and growling again, and slowly went into a thick bamboo once again. We could hear a second growl also that was from quite a distance, and we found it to be true what was said by the forest guard that he might me searching for a mate.It was an amazing experience to witness such a unique behaviour of a tiger, where it was calling for a mate. I was happy to see what forest guards are doing for our tigers, who else can step out on foot in front of a tiger just to check if he is injured. 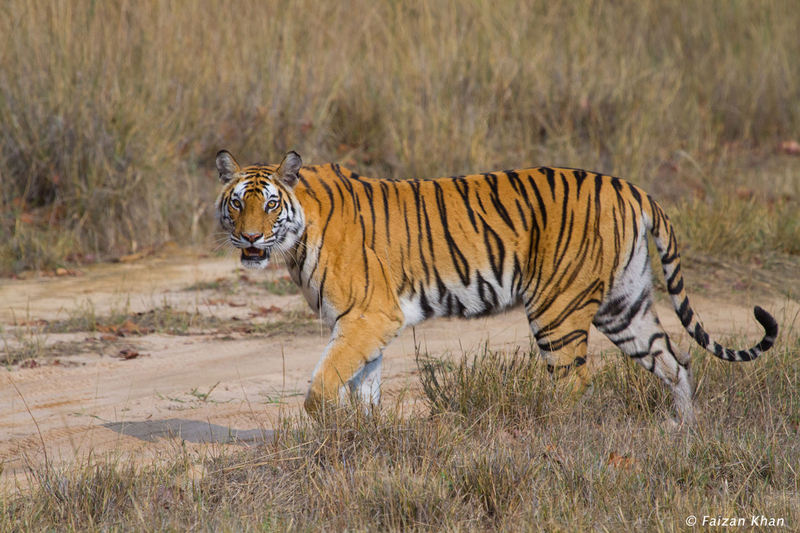 Later in the evening when we got back we had to establish the identity of the tiger, so we sat down with OMVEER CHOUDHARY A.K.A OMI, who is the Chief Naturalist of Tulis Tiger Corridor. After showing him a couple of photos, he said that this is BMW male. The Arrow mark on his right cheek was matching with the earlier photo of OMI. He is called BMW because, on left flank his stripe pattern is such that it looks like BWM is written. 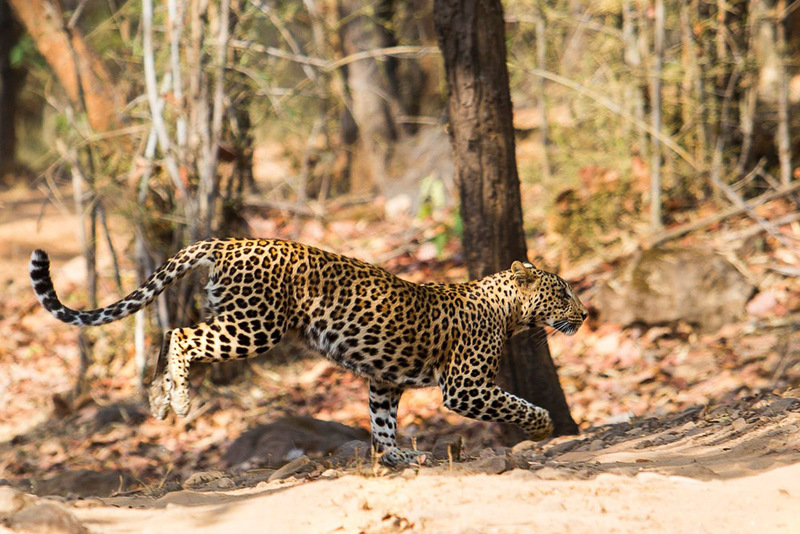 It’s now over 2 years since I last visited Pench, but that sighting is still fresh in my mind. Will be visiting Pench soon, and I just hope that I get to see BMW again, and the sighting is more thrilling that this one, fingers crossed.